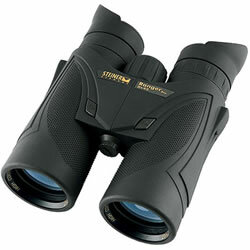 The Ranger Pro 10x42 is especially suited for hunting until twilight. This model sets new standards in it class. With outstanding optics with a wide field of view, ruggedness and comfort, these roof-prism binoculars are for the professional huntsman. Objective diameter 42 mm  Magnification 10 x  Weight 800 g  Width 125 mm  Height 148 mm  Depth 65 mm  Exit Pupil 4.2 mm  Luminosity 20  Twilight Factor 20.5  Field of view / 1000 m 122 m  Focussing System Fast-Close-Focus  Close Focus Range 1.9 m  High-Performance-Optics High-Contrast-Optics  Water proof Water pressure proof up to 3 m  Nitrogen-Pressure-Filling Via 2-way-valve-technology  Temperature Range -20 to +80°C  Eyecups Ergonomic twist-up eyecups  Rubber Armouring NBR-Longlife  Carrying Strap Neopren  Strap Attachment ClicLoc  Objective Cover Yes  Bag yes  Warranty 10 years.